Is it useful to put a bag of clothes in a container? Is it useful to reuse what we no longer use and is still in good condition? And recycle it? Yes, it is a lot: 30 years ago the selective collection of used clothing began in Spain and, since then, the Foundation has collected 276,000 tons of used textile. The non-profit organization takes stock of three decades of work coinciding with International Day for Recycling, which is celebrated on May 17. It is a day that invites to value the importance of recycling and reuse: through proper management, waste becomes resources. Every time we recycle and reuse we contribute to protecting the environment; We extend the useful life of the products and, when it finishes, we reintroduce them in the chain assuming the logic of the circular economy; We reduce emissions of greenhouse gases that aggravate climate change; And we create jobs in this green sector. 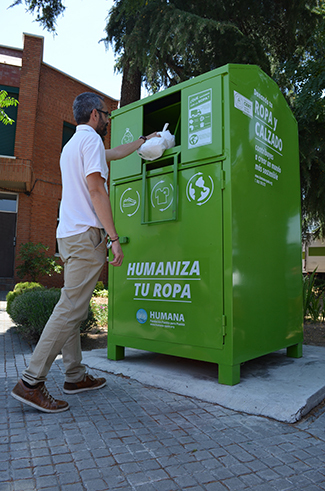 Humana Fundación Pueblo para Pueblo was a pioneer in Spain in the collection and preparation for the reuse of used clothing, using in the beginning wooden containers located in the street, later replaced by metal containers that guarantee high levels of usability and safety. The citizens' solidarity has allowed the collection of 276,144 tonnes of clothing, the equivalent of filling 5 times the premises of the Santiago Bernabeu stadium. They are garments that were mostly in good condition and whose useful life we ? ?have been able to extend, with the social and environmental goal always in mind. The main objective of the State Waste Management Framework Plan (PEMAR 2016-2022) is to reduce the waste disposal, ie, the least possible to the landfill. How to achieve it? Increasing readiness for reuse and recycling. After organic, packaging and plastics, paper and paperboard, and glass, textile waste is the fifth fraction we generate the most, and the one with the highest recovery percentage. However, their level of selective collection has much room for improvement. This used clothing is collected by an entity specialized in recycling and textile reuse, to valorize it and, with it, to generate resources. The clothes we discard are an asset that, properly managed, becomes a motor of progress in Spain and a generator of funds for development cooperation in the Southern Hemisphere. 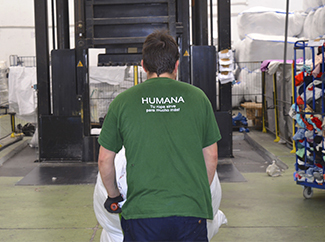 Humana has 5,100 containers throughout Spain thanks to agreements with 2,000 municipalities and companies. Two million donors annually deposit at least one bag with clothing at one of these collection points. This allows the non-profit organization to collect annually some 18,000 tons of clothing and footwear, whose appropriate management allows it to generate funds for social purposes: since 1987, it has earmarked more than 32 million euros for cooperation projects in the countries of the South . The 68% are own resources generated with the activity of collection and preparation for the reuse of used textile and the rest, external contributions. In addition to the social benefits, the reuse and recycling of textiles contribute to environmental protection and the fight against climate change: in addition to recovering garments, avoidance of landfill, contributing to the reduction of greenhouse gas emissions. greenhouse effect. Each kilogram of clothing that is reused and not incinerated avoids the emission of 3.169 kg of CO2, according to data from the European Commission. The 276,144 tons collected during 30 years in Spain represent a saving of 875,000 tons of CO2 to the atmosphere, which the planet is grateful for. Or what is the same: equivalent to the annual emission of 328 thousand cars (circulating 15,000 km annually) or the annual absorption of carbon dioxide that make 6.5 million trees. What does the future hold for a sector with a large margin? One of the challenges is undoubtedly placing the used textile to the level of other waste such as glass or cardboard, due to the high potential for exploitation. At present, each Spaniard gets rid of some 24 kilos of used clothes a year, according to the PEMAR data. It is estimated that less than 10% is collected by an authorized waste manager for its correct treatment.